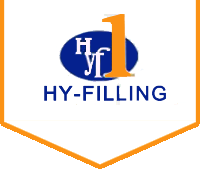 The main Products of Hy-Filling are mono-block rinsing/filling/capping machine for still water.carbonated soft drinks and hot-fill juices.Hy-Filling's machine can handle variety kinds of beverage containers,like PET bottles,glass bottles,aluminum cans and tinplate cans.Other related products include:carbonating mixer,5 Gallon bottles washing/filling/capping machine,can filler/seamer,bottles warming tunnel,bottle cooling tunnel,bottle tilter,cap elevator,etc.Hy-Filling can also provide custom-made machine according to customer's special requirement. Hy-Filling believes that the quality is the key of a company.And quality should not only be addressed during production,but also should be paid great attention to in all aspects,including professional consulting before sales and intime supports after sales.Hy-Filling has gained the trust from the customers all over the world,and its products have been exported to the U.S.A,the U.K,Japan,Africa,Middle East,South-East Asia,etc. Hy-Filling has acquired the ISO 9001:2000 certificate,CE certificate,and has been honored as the Excellent Supplier for Beverage Filling Equipment and High- technology Company.